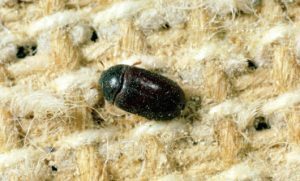 Q: A homeowner is finding about a dozen black carpet beetle adults (Attagenus unicolor) in her bathroom every day. There are no carpets or other wool products in the bathroom. What do you think is the source? How can I best control this problem? A: Black carpet beetles are scavengers, feeding on many different organic products. In fact, they are seldom found feeding on wool carpets, but many of their relatives do damage wool carpets. I suspect the beetles in question are coming from a source in either the attic or an exhaust vent. Old bird nests are a source in vents. A wide variety of things in the attic could be a source, and the beetles are working their way down through a ceiling light fixture. Locate the source and treat the area with a residual insecticide. If you can’t find the source, don’t worry. These beetles usually emerge in late spring and are a nuisance for only a few weeks. A good crack-and-crevice application should reduce the problem, and then it will disappear on its own until next year. Q: An apartment, which is half below grade, is having a centipede problem. These are not house centipedes. They are coming from the exterior of the building. The foundation walls are stone without any known voids. We have sprayed a residual on the exterior soil and have done the same inside. The tenant is still seeing centipedes. Where do we go from here? A: The breeding source is probably below grade on the exterior. Therefore, I suggest you rod the exterior soil just as though you were doing a termiticide application. I would suggest one of the appropriately labeled pyrethroids, most of which work well on centipedes. When you do the rodding, you might need to have a partner inside looking for seepage through the stone foundation. Q: A house was built in our area and the contractor accidentally broke the main waste line as it exits the foundation. The foundation is poured concrete. Waste seepage occurred for nearly a year. Now phorid flies are being found in the basement utility room. We recommended that the contractor excavate the area and remove contaminated soil. A French drain with a gravel bed is at the footer. Gravel and the soil beneath have been removed. The waste line has been repaired. Fly activity subsided immediately. The contractor began to place soil back over the French drain. Almost immediately, flies were being found in the utility room. This room has a sump pump to remove water as the French drain feeds into it. Some flies have been found in the sump. What do you think is the source, and how should we proceed? A: It sounds complicated, but I think you made the correct recommendations. I suspect that some contaminated soil was missed — and it might be impractical, or even impossible, to locate it. It’s my opinion that when the contractor began to cover the French drain, he cut off the escape path of the remaining flies. The flies then found their way into one of the drainpipes that feed into the sump in the utility room. I suggest hanging a dichlorvos strip in the sump and keep the sump cover on. The strip should be replaced every three to four months until flies no longer appear. Email your questions about insect identification and pest management technologies and techniques to Dr. Doug Mampe at dentomol@aol.com. They most likely will be printed and answered in one of Pest Management Professional’s upcoming Ask the Expert columns.